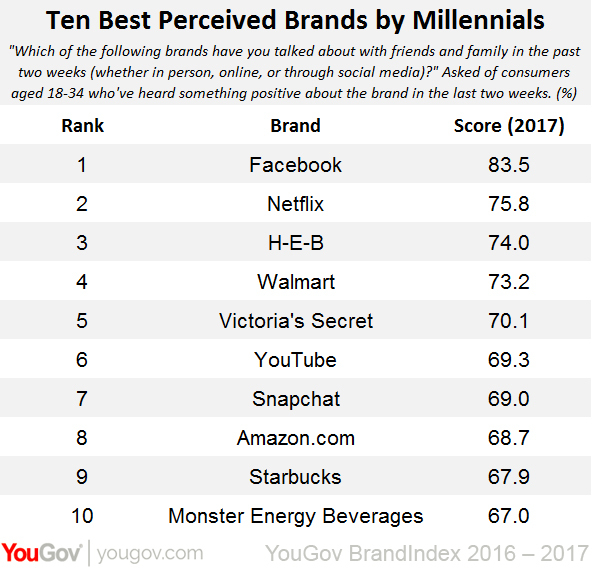 While Facebook and Netflix retained their hold on the number one and two spots of YouGov BrandIndex's brands generating the most positive word of mouth among millennials, the number three brand may not be known by many people outside of the Lone Star State. H-E-B – which persuades 74% of millennials who have heard recent positive news about the brand to then talk about the company with their friends and family – is a Texas-based grocery chain with 350 locations. It’s known for its Texas-centric packaging and promotions, massive produce sections, prevalent sampling, friendly customer service, and “do-it-yourself” options such as creating your own six-pack of beers and make-your-own-pizzas. While much has been made of regional supermarkets such as Krogers, Wegmans, and Publix, none of their metrics came close to H-E-B with adults 18 to 34. Massive global retailers Walmart and Amazon are prominently represented on the top 10, with Amazon even moving up two spots since last year. The fifth position now belongs to lingerie and womenswear marketer Victoria’s Secret. Some analysts feared the demo would reject Victoria’s Secret’s focus on logos and body image, but the company’s dominating social media presence and annual runway showcase seems to have steered it the other way. In a related milestone, plus-size retailer Lane Bryant gained the most in positive word of mouth generation among millennials over the past year. With celebrities like Melissa McCarthy and Rebel Wilson gracing magazine covers and movie ads, Lane Bryant jumped from 31% to 45% on Word of Mouth, a 14-percentage point hike. If there is any doubt there is still strength in the energy drink sector, Monster Energy Beverages came in at number 10, likely benefiting from its global distribution deal with Coca-Cola. While competitors Rockstar, 5-Hour Energy, and AMP have seen sales declines, Monster’s went up 2.2%. 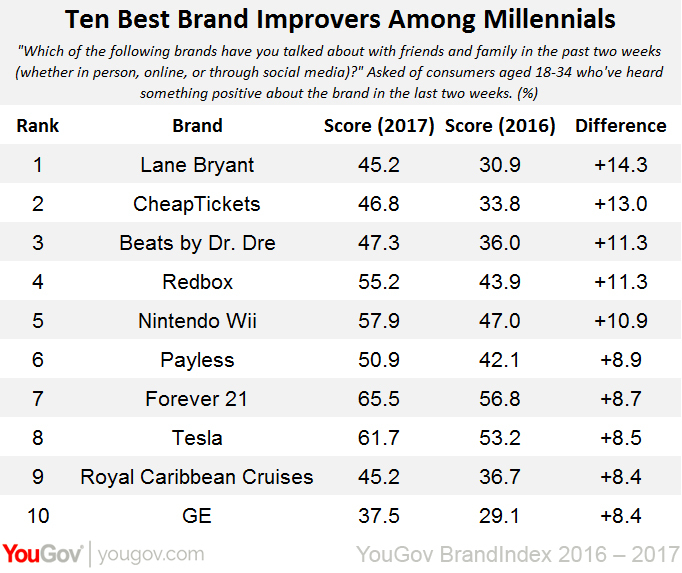 For this ranking, YouGov BrandIndex first screened all of its 1,500 brands for positive Buzz, which asks respondents "Have you heard anything positive about the brand in the last two weeks, through advertising, news, or word of mouth?" Brands with low response volume were eliminated. From those brands, they were then ranked on Word of Mouth scores, which asks respondents "Which of the following brands have you talked about with friends and family in the past two weeks (whether in person, online, or through social media)?" All respondents for this research were adults 18 through 34 years old. Data was collected between September 1, 2015 and August 31, 2017.